Vancouver, BC, August 08, 2017 – Mirasol Resources Ltd. (TSX-V: MRZ, OTCPK: MRZLF “Mirasol”) is pleased to announce discovery of the new high grade Ag-Au vein, the Resolution Prospect (Figure 1) where reconnaissance rock chip sampling has returned assays of up to 6,181.4 g/t Ag (198.7 oz/t) and up to 4.79 g/t Au (0.15 oz/t) at the Company’s 100% owned Nico project, Santa Cruz Province Argentina. Additionally, Mirasol has more than doubled the area of the Nico Project by staking of new claims to secure extensions of the volcanic complex related to the mineralization, bringing the total project area to over 53,000 ha. Mirasol CEO Stephen Nano stated: “We are very encouraged by this season’s exploration results at our Nico Project where the Company is outlining a multi-target high grade Ag – Au district with favourable logistics in proximity to two operating mines”. 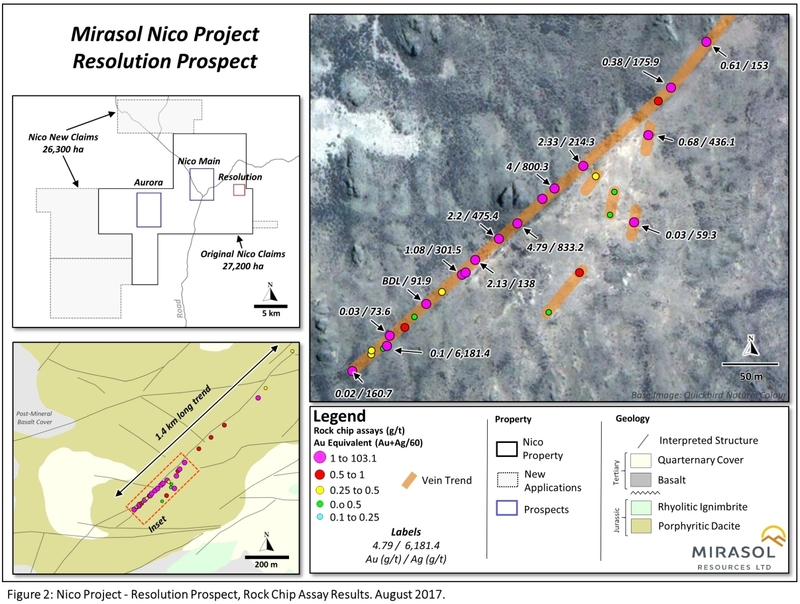 Reconnaissance mapping and sampling at the Nico claims, approximately 12 km to the east of Mirasol’s recently announced Aurora silver – gold prospect (see news release July 5, 2017) has led to the discovery of a new high-grade epithermal vein at Resolution. The mineralization reports to oxidized veins and veinlets of grey chalcedonic silica with localized zones of banded saccharoidal silica and breccia textures hosted in dacitic subvolcanic. The structure has been traced in outcrop and float for 1,400 m varying in width from a few centimetres up to 0.5 m wide at surface (Figure 2). Mirasol has also reported high-grade Ag+Au assays of up to 2,095.0 g/t Ag (67.4 oz/t) and 35.09 g/t Au (1.128 oz/t) from the strongly mineralized, multi-kilometre long, Aurora vein-breccia prospect. In addition, the Company has undertaken a preliminary desk top re-evaluation of previous Joint Venture partner drilling from 2009 at the Nico Main prospect. This has highlighted shallow drill intersections of up to 8.25 m @ 0.43 g/t Au and 37 g/t Ag, including 1.25 m at 2.17 g/t Au and 197 g/t Ag (5.45 g/t AuEq60*) which remain open to depth and warrant further drill testing. The geological understanding emerging from this season’s exploration at the Nico Project suggests that mineralization is associated with a large rhyolitic flow dome and pyroclastic complex that overlies the regional rhyolite ignimbrites volcanics of the Chon Aike formation. At Nico, epithermal intermediate sulphidation vein -breccia mineralization is developed at several prospects both within the dome and pyroclastic complex and the underlying Chon Aike volcanics. 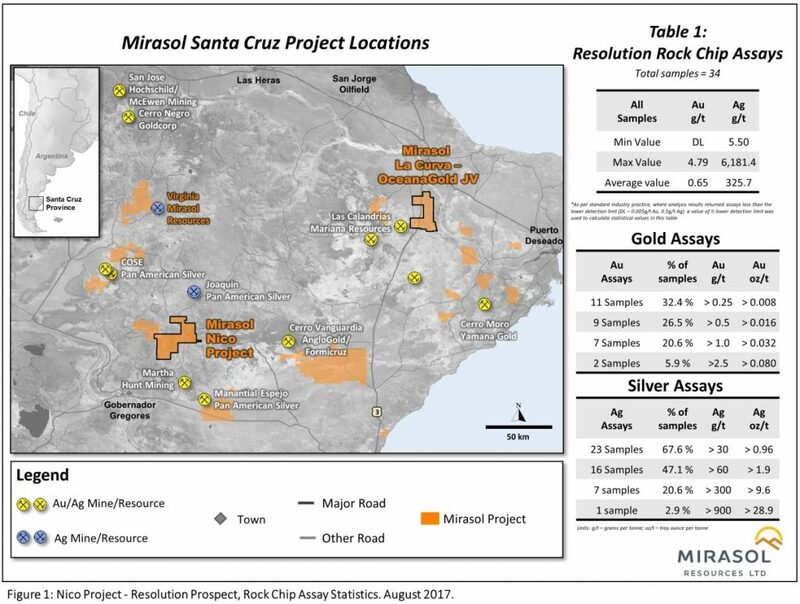 To date, Mirasol has identified three prospects Aurora, Resolution and Nico Main where strongly anomalous to bonanza grade silver – gold assays have been returned from surface rock chip sampling and historic drill intersections at the Nico Project. Mirasol has ceased its reconnaissance at Nico due to the onset of the southern hemisphere winter and eagerly anticipates the re-initiation of the spring work season in mid-September 2017 to continue exploration of this exciting precious metal project. Mirasol applies industry standard exploration sampling methodologies and techniques. All geochemical rock and drill samples are collected under the supervision of the company’s geologists in accordance with industry practice. Geochemical assays are obtained and reported under a quality assurance and quality control (QA/QC) program. Samples are dispatched to an ISO 9001:2008 accredited laboratory in Argentina for analysis. Assay results from surface rock, channel, trench, and drill core samples may be higher, lower or similar to results obtained from surface samples due to surficial oxidation and enrichment processes or due to natural geological grade variations in the primary mineralization.